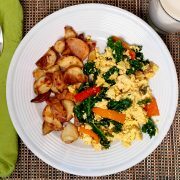 My first attempt at a Tofu Scramble was a combination of recipes that I found online. Turning a block of tofu into “scrambled eggs” isn’t exactly common sense for someone who’s never done it before so I needed some help. Some of the recipes were good, but the instructions were really lacking. The cooks who wrote them take for granted that new plant-based eaters need everything explained. That’s what I’ll aim to do here. If anything is confusing, please let me know so I can fix it. If you serve this delicious tofu scramble to someone and don’t tell them it’s tofu, I doubt they’ll know. It looks and tastes just like scrambled eggs. 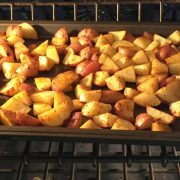 I like to put some salsa on mine with a side of oven roasted red potatoes and a glass of unsweetened cashew milk. Very tasty. 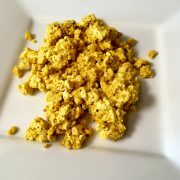 The turmeric is the key to the scrambled eggs color. 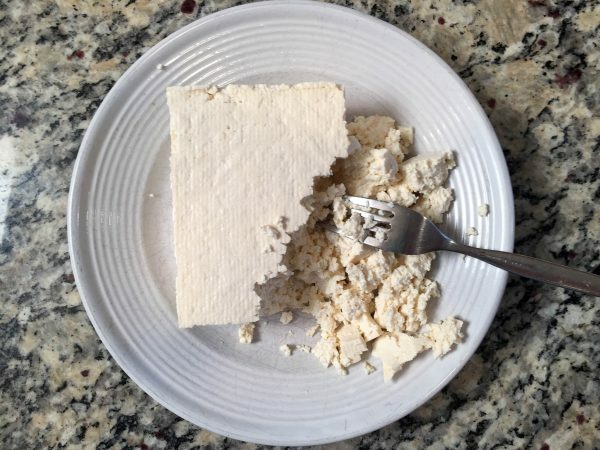 A half a teaspoon is all you need for a standard block of tofu. 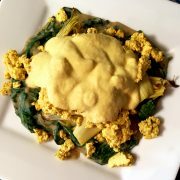 Any more and the tofu scramble is too yellow. Any less and it’s not yellow enough. Indian or Himalayan Black Salt is another vegan trick ingredient to simulate an egg taste and smell. It contains sulfur and actually smells like hard boiled eggs. Indian Black Salt is different than Hawaiian Black Salt or Black Lava Salt so you can’t interchange the two. 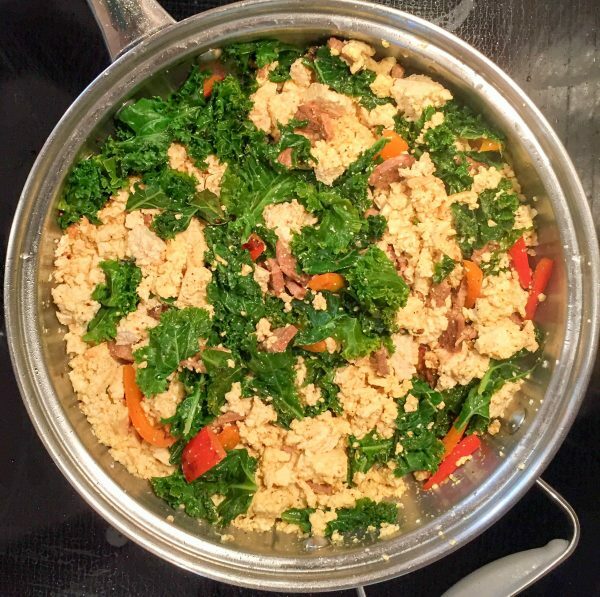 Skip the tempeh to make this a soy free recipe. 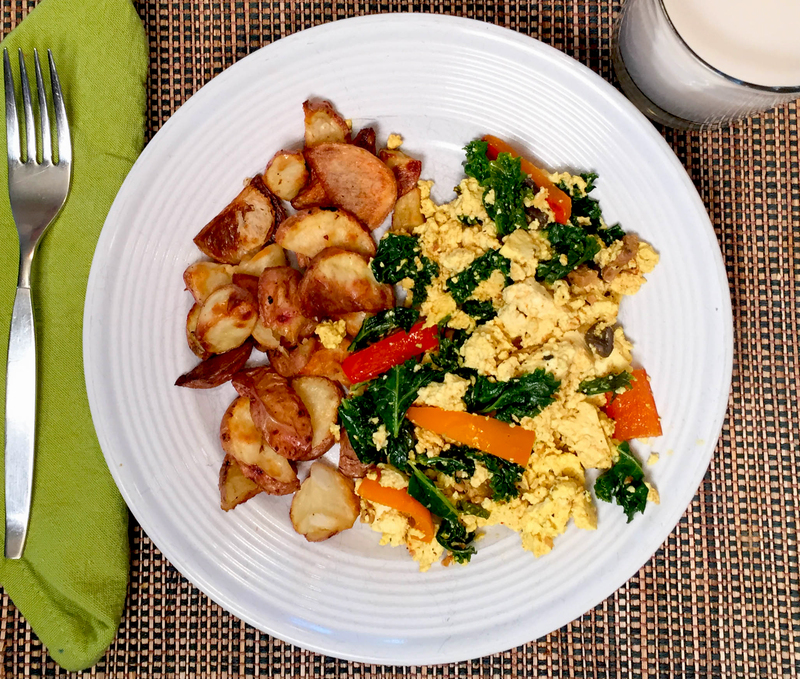 This Tofu Scramble recipe is one of my favorites. The Himalayan Black Salt gives it the smell of real eggs and the Turmeric gives it the color. Drain the tofu over the sink to get as much water out as possible. Place a cheesecloth or double paper towel on a plate or cutting board. Put the tofu brick on one side of the towel and fold the towel over the tofu to cover it. Place a heavy pan or object on top of the tofu to press it. This will squeeze more of the water out. Let it stand while you're preparing the other ingredients. Tear or chop the kale into small pieces, about the size of a half dollar. Set aside. 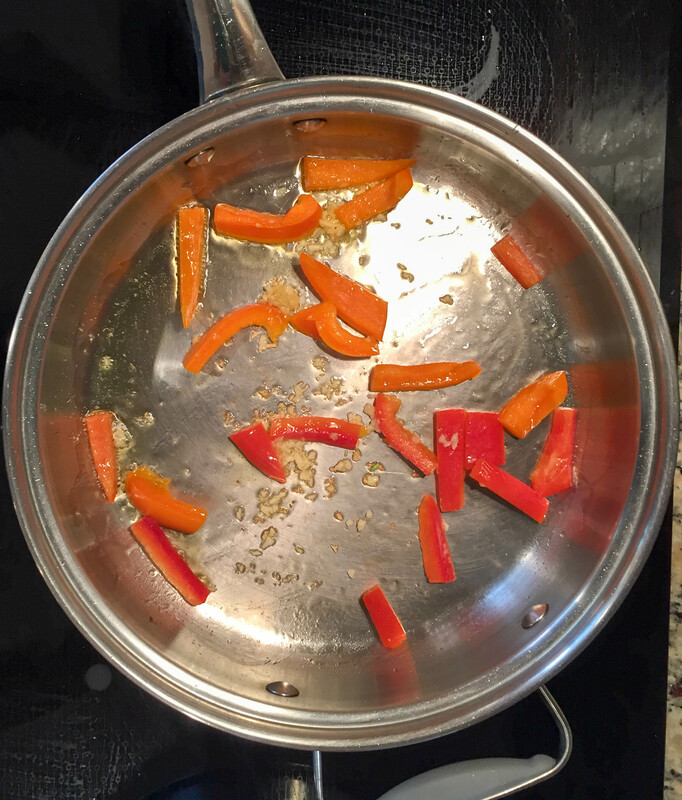 Slice the bell peppers into slim strips. You can also add mushrooms, onions, shallots or any other kind of delicious veggies. Don't go overboard with the quantity unless you adjust the seasoning amounts or it won't taste as good. 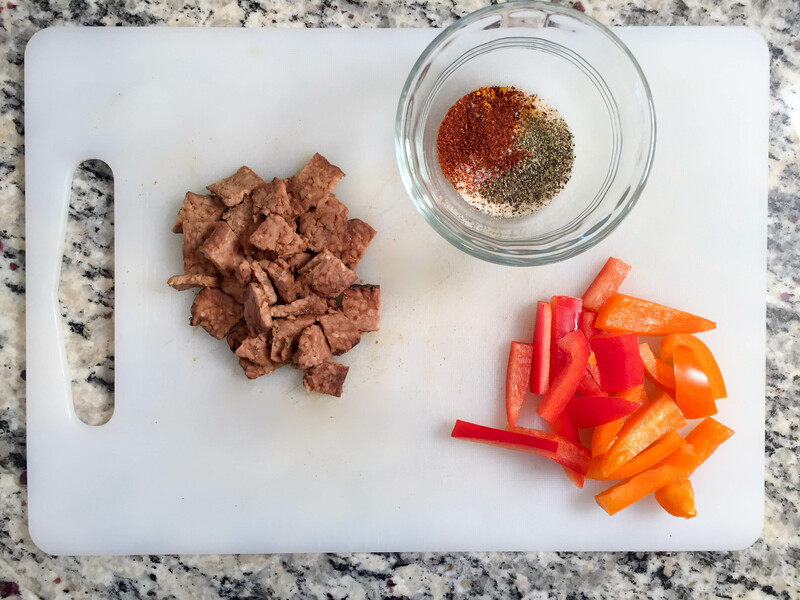 Cut the tempeh into small squares. Set aside. Skip this to make the recipe soy free. Add the seasonings to a small bowl. Then add 1/4 cup water to the seasonings bowl and stir to mix well. Heat 1/2 cup vegetable broth in a large pan over medium heat. Add the bell peppers and cook until slightly tender. About 1 to 2 minutes. Then add the minced garlic and cook for another minute while stirring. Add more broth if needed. 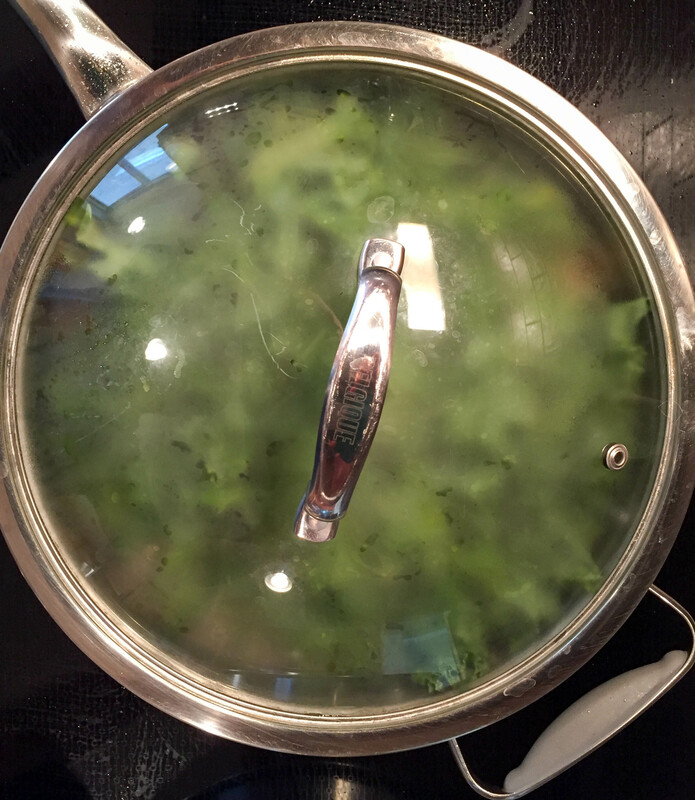 Add the kale to the pan and cover to steam the kale for 1 to 2 minutes. 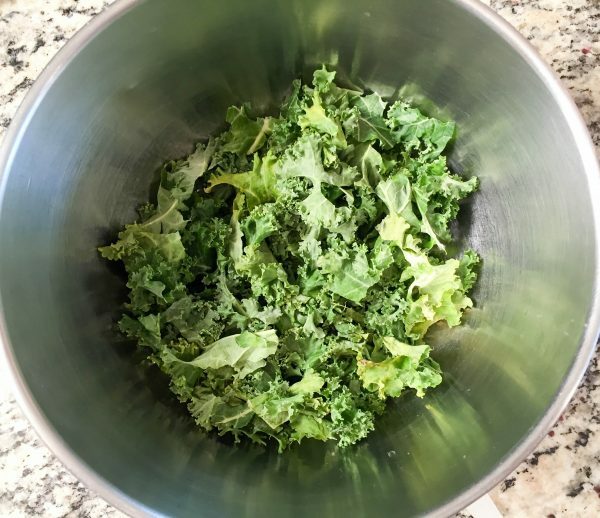 This will make it soft and remove the bitter taste that some kale has. 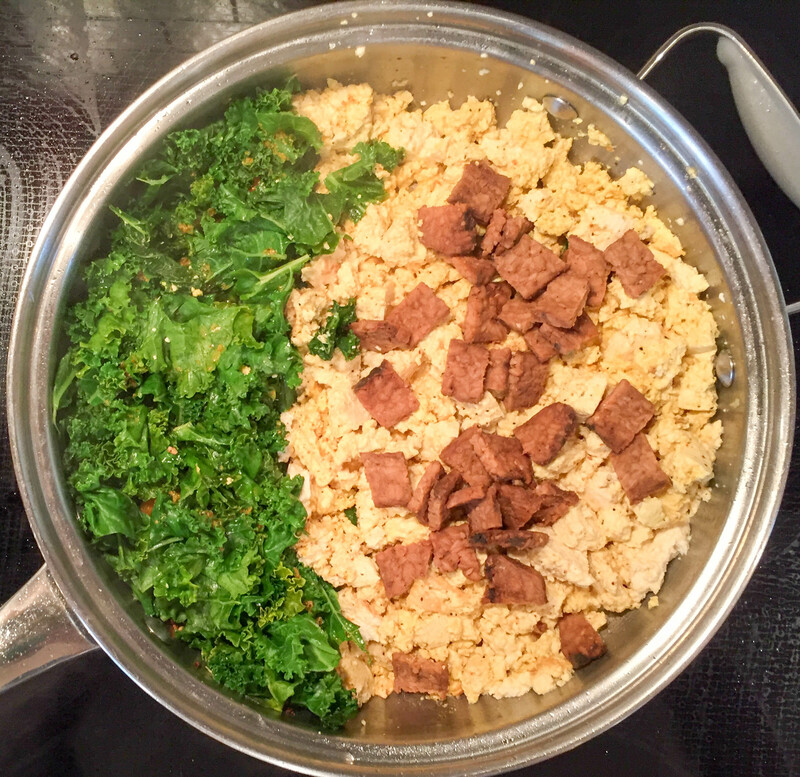 While the kale is cooking, scrape the tofu with a fork to crumble it into small scrambled egg size pieces. 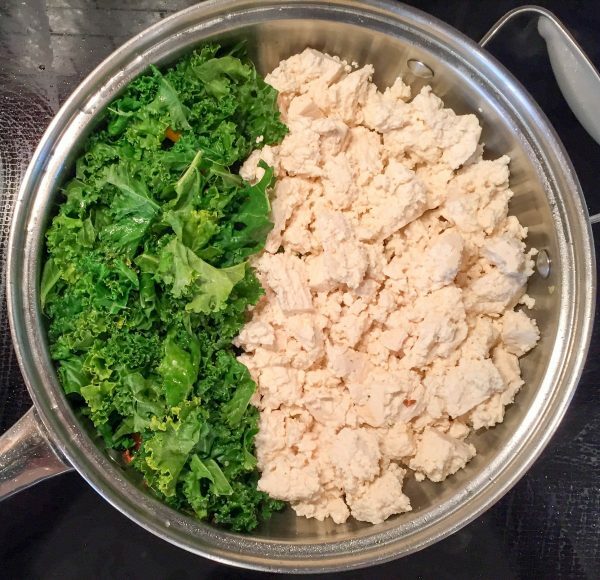 Move the veggies to one side of the pan and add the tofu to the other side. Cover and cook for 1 to 2 minutes to heat the tofu. Sprinkle the seasoning mixture over the tofu and veggies, 80% on the tofu. Stir the tofu until it takes on a yellow hue from the turmeric. Then add the tempeh on top of the tofu. Cover and cook for 1 minute. Stir all the veggies, tempeh and tofu together in the pan over heat until mixed and heated through. Serve immediately. Refrigerate leftovers for up to 5 days. Serving size is about a cup.